This year, we approached the Knotts Berry Farm Halloween Haunt with an edge of fear in our soul that had little to do with the eager anticipation of ghost town ghouls, fallout shelter mutants, lock-down asylum lunatics, or apocalyptic wasteland warriors. Rather, advance word had sinisterly suggested that the annual Halloween theme park attraction was but a pale, ethereal shadow of its formerly spirited self - a "creaky, middle-aged zombie that's lost its will to rise from the grave every night," in the words of this Los Angeles Times review of opening night. To our ghoulish delight, however, these dire prophecies of doom turned out to be ephemeral warnings of a disaster that failed to materialize. We suspect opening night jitters may have been the real culprit, rather than a waning spirit. 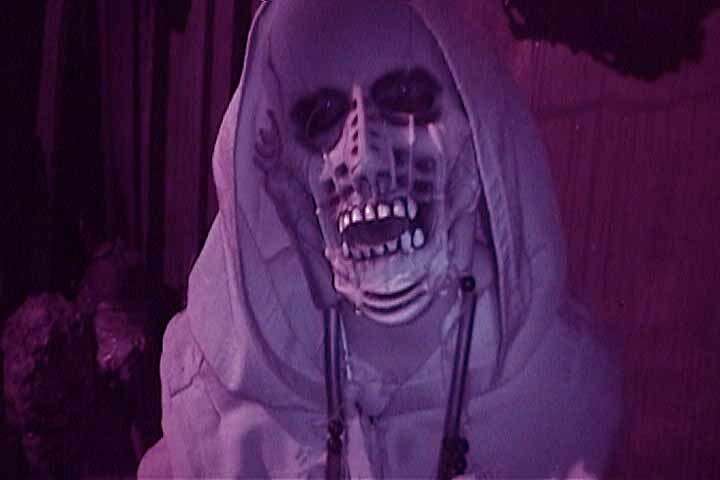 Whatever the reason, on Sunday night, October 2, we found the 2011 Knotts Scary Farm to be as much frightful fun as ever. True, there is little that is innovative or ground-breaking this year; nevertheless, the depth and breadth of horrors on display continue to make this annual ritual a must-see for Halloween acolytes in Los Angeles and the surrounding area. It's been years since we missed the Halloween Haunt's opening weekend, and we had begun to wonder whether our earlier arrival was coloring our assessment of the event. Perhaps the opening night electricity galvanized the ghouls like a mad scientist's machinery jolting life into the Frankenstein Monster - only to fade away over the ensuing nights? Fortunately, we found little evidence of that on Sunday. From the moment we crossed the threshold until, hours later, we retreated from the onslaught of horrors, the park was infused with an engaging Halloween spirit. As always, the density of scares is impressive for an event taking place in such a large area. There were monsters everywhere - in the mazes, in the scare zones, sometimes simply roaming free - and they were eager to scare unwary visitors. This is quite a challenge, when you consider how few visitors are truly unwary after having paid their money to attend the Southland's biggest and oldest Halloween theme park attraction; yet the gangs of sliders and screamers succeeded predatory relish. Once again, Knotts Scary Farm impresses with its variety of scares. With dozens of mazes, rides, and shows, there is quite literally something for everyone, and it is difficult to imagine even the most dissatisfied customer the haunt without having experienced at least a pleasant shiver or two. Where the Knotts Berry Farm Halloween Haunt falls a bit short is in maintaining distinction among its scare-acters. The mazes offer multiple environments, each suggesting its own brand of horror, but too often (not always) there is a generic quality to the monsters, leading to a deceptive sense of deja vu: Isn't that monster in the new Delirium maze the same one I just saw in a nearby scare zone? Well, probably not, but in the shadowy darkness, the similarity can be deceptive. There are three new attractions this year: Delirium (near Ghost Rider, immediately after Lockdown: The Asylum); Invasion Beneath (on the Calico Mine Ride); and Endgame: Warriors of the Apcolypse (in Campy Snoopy). 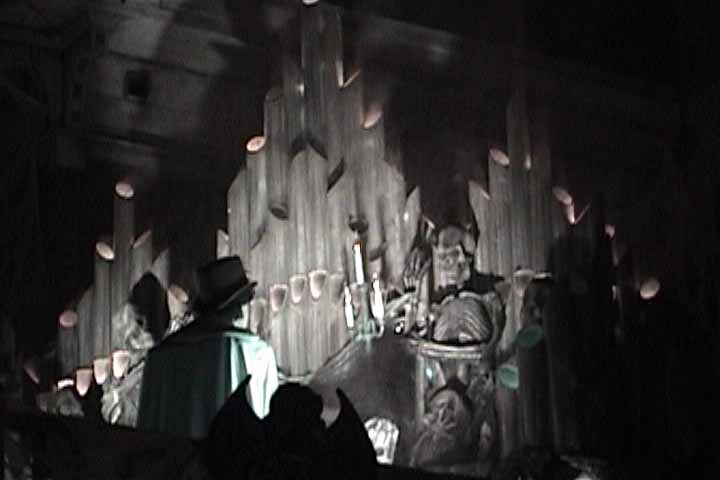 None of them are likely to enter the pantheon of fan favorites, but all have their own appeal, and they are different enough from each other (and from the returning mazes) to provide much-needed variety - which has always been the magic silver bullet that kept the Halloween Haunt's baying competitors at bay. No matter how much more technically impressive Halloween Horror Nights at Universal Studios Hollywood may be, it cannot offer as much variety as Knotts Scary Farm. DELIRUM is a bit of a generic theme, a sort of generic psychedelic nightmare in which anything goes. The entrance, loaded with over-sized eyeballs, is certainly eye-catching (you should pardon the phrase), and there is a pleasantly odd assortment of weirdness on view inside. The vagueness of the theme makes this haunt a bit hard to characterize, but in a way that works in its favor: you don't know quite what to expect. INVASION BENEATH imagines that the Calico Mine Ride has been invaded by some kind of hive-mind aliens. This provides an opportunity for a different kind of monster - tall and silent, with glowing red lights for eyes - but these creatures are realized for the most part with static figures instead of actors. There are a few nice mechanical effects, and the darkness of the mine ride makes just about any theme effective, but this one could use a little more juice. ENDGAMES: WARRIORS OF THE APOCALYPSE suggests a cheesy exploitation rip-off of THE ROAD WARRIOR, but the post-apocalyptic setting is nicely realized, and the heavy-duty metal music throbs loud enough to generate plenty of tension. There is a certain macabre black humor on view, with the suggestion that mankind had descended into barbarism, with the survivors getting their jollies from watching sick gladiator-style games. This is probably the most distinctive maze we have encountered this year; it's a great idea for something different, but it would benefit from a few more jolts. We made a point of making return visits to the two mazes that debuted at last year's Halloween Haunt: Virus Z and Fallout Shelter. VIRUS Z sustains itself with its satirical premise: the happy Eisenhower-era town of Pleasanton is no longer so pleasant after a viral outbreak turns the populace into zombies. The demented diners, theatres, and other settings are a real hoot, whether or not you are particularly scared. FALLOUT SHELTER - one of a trio of 3D mazes - is a bit less successful. The rendering of life underground after a nuclear Armageddon is nicely done, but the 3D element is distinctly lacking, due to the monochromatic sets. The effect improves during the second half when objects display a radioactive glow (achieved with black lights), but if you haven't already bought the 3D glasses for the other mazes, don't buy them for this one alone. We also stopped by some old favorites. TERROR OF LONDON has been around a few years now, but it does not feel worn out. This attraction is cleverly conceived in such a way that it defeats a potential problem that undermines many mazes: lack of enough actors to fill all the spaces. Not that its corridors are empty - there are plenty of actors on view - but Terror of London suggests you are on the trail of Jack the Ripper. As you encounter bodies, accompanied by voices remarking that the killer has struck again, while a casual whistling suggests the perpetrator merrily making his escape, there is an elusive quality to the scenario: if you don't actually see Saucy Jack (as we did not), it intensifies the mystery. The ending of this maze has been changed this year, removing the mad scientist's lab at the end - which had caused us confusion in previous years. (Were the Ripper's murders perpetrated to obtain body parts for Frankenstein's Monster? Who knows?). CORNSTALKERS remains strong on atmosphere. When it debuted a few years ago, some WIZARD OF OZ elements were awkwardly interpolated, but those have long since been jettisoned, leaving just the creepy cornrows, crows, and...other things. The outdoor setting provides a different vibe from the other mazes, and the living scarecrows are distinctive monsters. This is more eerie than many of the other mazes; there are still some jump-scares, but the emphasis is more on mood. When THE DOLL FACTORY opened its doors back in 2007, it was a wonderful disturbing addition to the Halloween Haunt's complement of mazes. Four years later, the inspiration seems to be waning. We're not sure whether the maze itself is not as good or we have simply become too accustomed to its terrors, but the old thrill is gone. We definitely missed the spastic doll girl, whose staccato movements suggested a mechanical creation brought to a mocking simulation of human life. Is she gone for good, or was she just on break when we walked through? DIA DE LOS MUERTOS is a maze that disappoints some with its lack of intense shocks, but we have always enjoyed its colorful presentation. For its first half, there is a demented festival atmosphere that makes the trek almost like a visit to a Halloween party. Later, La Llarona - the "Crying Woman" of Mexican legend - shows up to send a few shivers up and down spines as visitors traipse through a graveyard. Finally, the maze moves into the jungle, where Aztec gods demand living sacrifices. Dia de Los Muertos benefits from its distinctive theme: the monsters, sets, and props are decidedly not interchangeable with those in other mazes, and even after visiting all the other attractions at Knotts, you will not feel as if you are simply walking through the same old cemetery one more time. We missed out on Sleepy Hollow Mountain, The Slaughterhouse, and Uncle Bobo's Big Top of the Bizarre. The only one we regret is The Slaughterhouse, which has been ghoulish fun since its 2008 debut. In general, we were impressed with the ingenuity on display at the Knotts Berry Farm Halloween Haunt. The masks and makeup are no match for Halloween Horror Nights, but you are unlikely to notice this unless you are specifically looking to make comparisons; the monsters are usually lurking in shadowy corridors that hide any imperfections in their appearance. Also, the sets are not as detailed as those seen at Universal Studios's rival haunt, yet somehow Knotts Scary Farm utilizes them in an effective manor. Only Cornstakers is completely convincing, but the others work on their own terms: Terror of London captures of the foggy feel of Victorian England with some simple flats and props. The cartoony colors of Dia De Los Muertos make its jungle setting amusing if not believable. Fallout Shelter and Endgames cleverly use concepts that make threadbare settings seem perfectly appropriate: what do you expect from a make-shift fallout shelter or from the dwelling places of post-apocalyptic barbarians? One disappointment: The Ghost Town Scare Zone - the tiny seed from which the Halloween Haunt sprang - seemed a bit scaled back in 2011. Yes, there was still fog aplenty, hiding numerous unseen spirits, but the old organ-playing phantom (a prop mannequin) was missing, leaving a bare building where once there was a memorable Halloween display. We're not so much sorry to see it go as we are sorry to see that it has not been replaced - leaving a noticeable gap in its place. The crowds on Sunday night were very light; there was little waiting in line, even for the Calico Mine Ride, which often requires a wait even on slow nights. 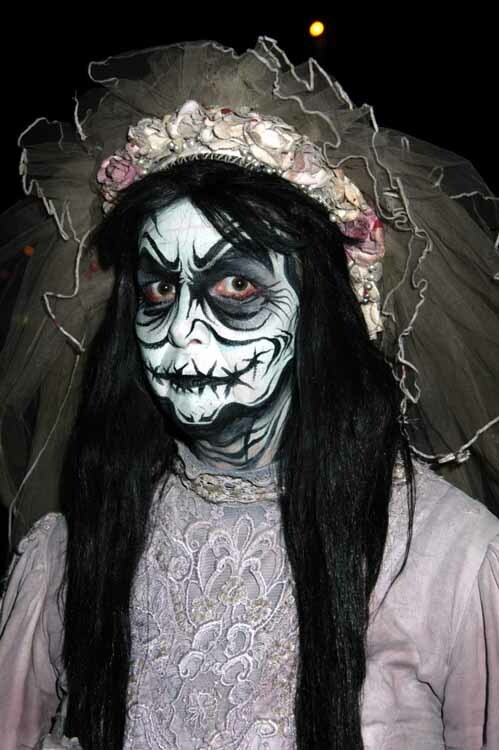 We repeat our annual admonition: Go early in the season if you want to see everything at Knotts Scary Farm. Knotts Scary Farm's remaining dates are October 5-9, 12-16, 19-23, 26-31. Hours are from 7pm to 1am on weeknights and Sundays, from 7pm to 2am on Fridays and Saturdays. ← Rotten Apple 907 presents "A Space Odyssey"